My mama always taught me to be a savvy spender. To show her that all those long lectures about the value of the dollar didn’t fall upon deaf ears, I took her to Mama’s Lu. I really could’ve taken her to any number of cheap and delicious Chinese restaurants in the San Gabriel Valley, but it seemed most appropriate to dine with my mama at a placed named after someone else’s mama. Mama’s Lu came highly recommended to me by Danny of Kung Food Panda. Even though he led me astray once with an unfortunate stinky tofu experience, I still trust him one-hundred percent when it comes to good eats. Mama’s Lu is owned by the daughter of Dean Sin World proprietress, Ms. Lu. 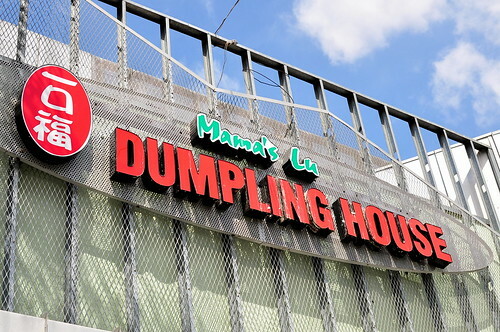 Not only did Ms. Lu pass on her superior dumpling making genes, but she also gifted her daughter with a knack for giving restaurants awkward names. 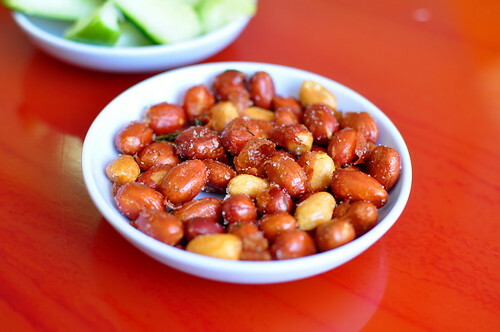 The Astronomer, Rosalind (The Astronomer’s lil’ sister), and I arrived at the restaurant before my mama did, so we snacked on complimentary peanuts while perusing the menu. When it came time to order, I followed Danny’s advice to a T. We started off with a Green Onion Cake ($1.99), which falls under the category of northern Chinese “bread food.” The texture of the thin pancake was crisp, slightly chewy, and not bogged down by too much oil. The chopped scallions provided a splash of color and flavor. I slathered my slices with chili oil because food tastes better when it burns a little. Next, we dug into a huge plate of Shanghai Rice Cakes ($5.99), my favorite dish of the evening. The smooth discs of joy were sauteed with pork, mushrooms, carrots, scallions, and cabbage in a savory soy-based sauce. 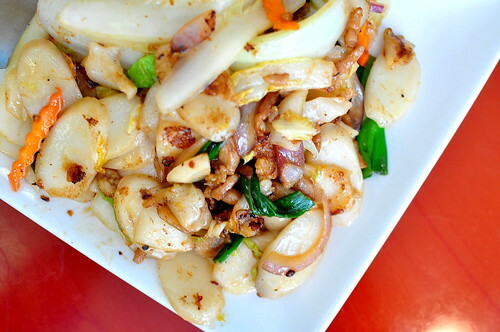 The rice cake’s quick fry in the wok imparted an overall smoky quality to the dish. I hereby revoke the name “rice cake” from those tasteless cardboard messes found in the breakfast aisle at every American grocery stores. They give rice cakes a dreadful name. 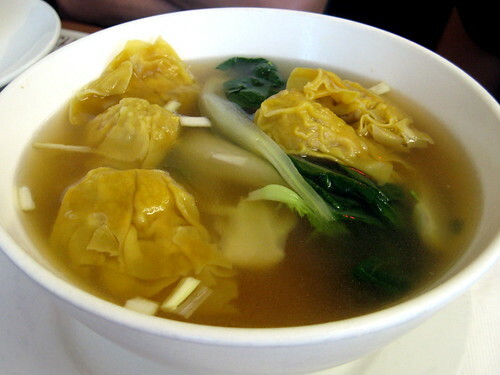 To add to our lovely meal of bread foods, my mama ordered a bowl of Shrimp Wonton Noodle Soup ($3.50). Mama didn’t care too much for the wheat noodles, but she liked the meaty dumplings very much. 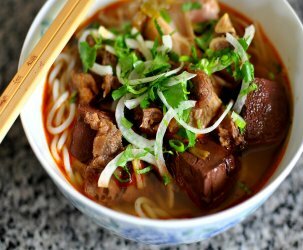 I thought that the mild broth married nicely with the noodly strands and plump wontons. The Juicy Pork Dumplings ($4.50) arrived hot out of the steamer with the requisite shredded ginger on the side. 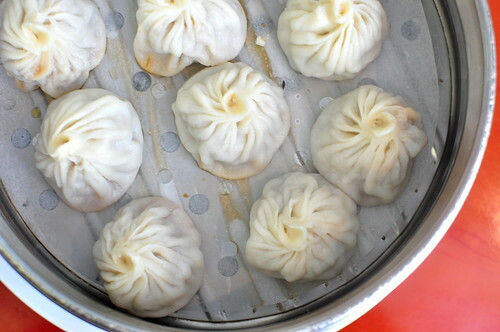 While not quite as juicy as the xiao long bao from Din Tai Fung, Mama’s Lu’s dumplings were well-priced and hit the spot. 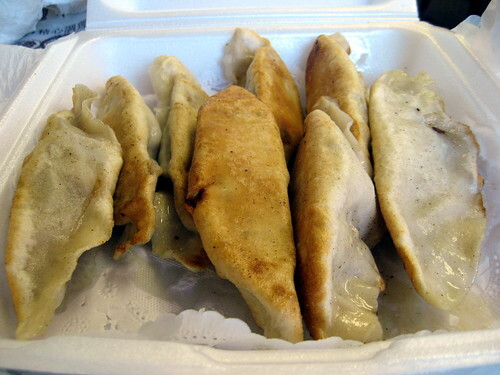 My mama loved Mama’s Lu so much that she ordered some Pan Fried Dumplings ($4.50) to-go for breakfast the next morning. good to know another good option besides DTF for those dumplings. I have laughed at this restaurant’s name for long enough. It’s time for me to go in! So I’m sitting here thinking, “What’s wrong with Mama Lu’s as a name? It’s cute and catchy.” and then I red ravenouscouple’s comment, looked above it and realized that it’s Mama’s Lu. Yeah, that’s kind of…awkward. But funny! Meanwhile, my cottage cheese for breakfast pales in comparison to your mom’s breakfast now. Thanks. ohhhhhhh i get it now. i didn’t read the name carefully until i saw fiona’s comment above. haha, gotta love engrish. btw, i love the 2pac reference. I love when you sneak rando weirdo lines into your eloquent reviews. 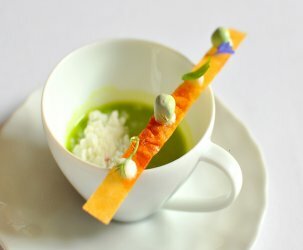 Wave that freak flag with pride, Miss Gastronomer! yes free the rice cakes! I think those are puffed rice cakes or popcorn cakes anyways… and I do love those chewy morsels. and that name is too funny for those of us who use the word loo! my first bite of pan fried seasoned rice cake at DTF had me at hello. this, the inari, the seitan, you’re right, we’re either soulmates or we’re both insatiable like gael greene. and to quote tupac, all i need in this life of sin is me and my mama lu. hehe. 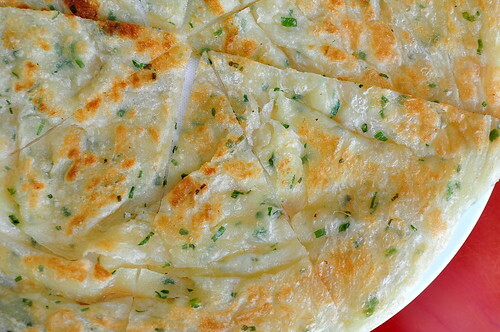 Those scallion pancakes look so good! 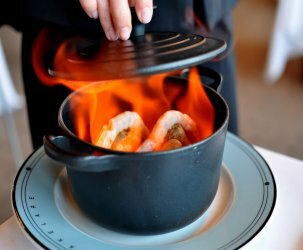 That green onion cake looks so good that I’ll have to have some the next time I’m back! Lately DSW is getting better with their menu, I think Mama’s Lu also improved on their menu where they used to only 18 items when I first came in. I still like the Savory and juicy taste of the Mama’s over the sweet and sticky taste of DSW in the XLB. Glad you and your mom like the place! 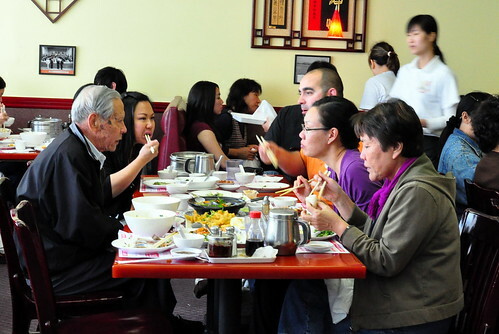 Hey G – I’m not a big fan of the XLB at Mama’s Lu, but that Nian Gao looks quite good. again…it’s post like this that makes me sad that I don’t live closer to LA….